The origin, evolution and speciation of the lion, has been subject of interest, debate and study. The present surviving lions of the genus Panthera comprise of eight sub-species inclusive of Asiatic lion Panthera leo persica of India's Gir forest. Except for the Asiatic lion, the other seven subspecies are found in different parts of Africa. There have been different opinions regarding the phylogenetic status of Panthera leo, as well as classifying lions of different geographic regions into subspecies and races. In the present study, mitogenome sequence of P. leo persica deduced, using Ion Torrent PGM to assess phylogeny and evolution which may play an increasingly important role in conservation biology. The mtDNA sequence of P. leo persica is 17,057 bp in length with 40.8% GC content. Annotation of mitogenome revealed total 37 genes, including 13 protein coding, 2 rRNA and 22 tRNA. 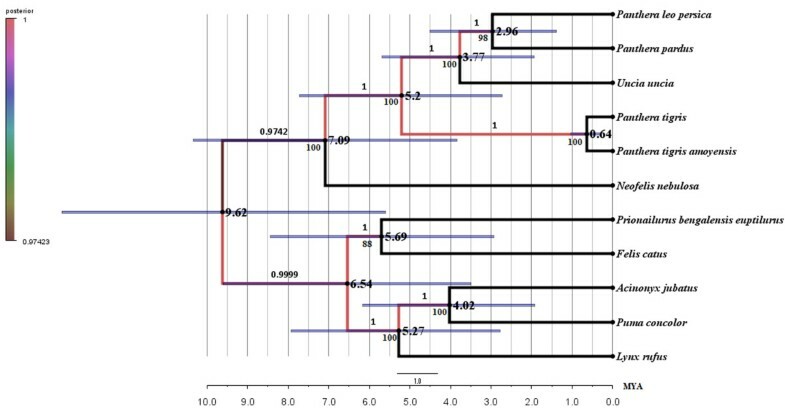 Phylogenetic analysis based on whole mitogenome, suggests Panthera pardus as a neighbouring species to P. leo with species divergence at ~2.96 mya. This work presents first report on complete mitogenome of Panthera leo persica. It sheds light on the phylogenetic and evolutionary status within and across Felidae members. The result compared and evaluated with earlier reports of Felidae shows alteration of phylogenetic status and species evolution. This study may provide information on genetic diversity and population stability. Five big charismatic cats: Panthera leo (lion), Panthera tigris (tiger), Panthera onca (jaguar), Panthera pardus (leopard) and Uncia uncia (snow leopard) have been placed taxonomically in Pantherinae subfamily. They have been drawing attention of biologists due to important ecological roles . Consequently, extensive information is available on their natural history, morphology, behaviour, reproduction, evolutionary history and population genetic structure, which provides a rich basis for interpreting genetic data . The information is still not adequate to overcome their highly threatened status. Hence, molecular study is vital to further explore the genetic information which can be helpful for conservation. Panthera leo has two geographically isolated populations; Panthera leo leo (African lion), and Panthera leo persica (Asiatic lion) . The Asiatic lion population is accorded endangered species status under the Indian Wildlife Protection Act, consisting only 411 wild animals . This population exist in and around Gir forest in the southwest part of Saurashtra region in the State of Gujarat, India. Presence of geographically confined single population having its origin from small nucleus group and constituting single gene pool, raises concerns about genetic diversity in Asiatic lion population. Morphological and molecular approaches like allozyme study  microsatellite analysis , protein markers and mitochondrial 12S gene  have been used to unveil the evolutionary history of this species. Earlier efforts have been made to undertake the population study of Panthera leo persica (NCBI Taxonomy ID: 83386) and other allied species  to establish phylogenetic status. However, it has been found to be perplexing . For the last decade, mitochondrial DNA has been one of the most commonly used molecular marker in vertebrates for studying phylogeny and evolutionary relationships  among closely related species and subspecies . It can reveal evolutionary relatedness and elucidate large numbers of genome-level characteristics, such as relative arrangements of genes . It also has a great importance for the molecular identification of species. Cytochrome b and Cytochrome oxidase subunit I  are mitochondrial genes widely used for molecular identification of animals. Further, key mitochondrial features - a lack of recombination, essentially maternal inheritance, high evolutionary rate, compact size, and conserved gene order , have led to its wide spread use. Earlier, phylogenetic relationship of the genus Panthera was studied using morphological, biochemical as well as molecular characters but it is still debatable and troublesome because of large disparities between these studies. The difficulty in resolving their phylogenetic relationships is a result of (i) a poor fossil record, (ii) recent and rapid radiation during the Pliocene, (iii) individual speciation events occurring within less than 1 million years (iv) probable introgression between lineages following their divergence . Phylogenetic relationship and position of Panthera leo, amongst the genus Panthera, has some knowledge gaps. The present study aims to provide some insights through the complete mitogenome of the Asiatic lion. Mitochondrial genome sequence of any subspecies of Panthera leo, is not reported in literature. Present study describes sequencing of complete mitogenome of Asiatic Lion (P. leo persica) with the use of next generation sequencing technology on Ion TorrentPGM platform. The relationship of lion subspecies with other Felidae species and their evolutionary status has also been described on the basis of comparative analysis of mitogenomes. The complete mitogenome sequence of P. leo persica is 17,057 bp in length (GenBank accession No: KC834784), which is larger than Panthera pardus (16,964) and Uncia uncia (16,773). The base composition of mitogenome of P. leo persica is A, 5445 bp (31.92%); T, 4650 bp (27.26%); C, 4492 bp (26.33%); G, 2470 bp (14.48%); A+T 9939 bp (59.18%), G+C 6879 (40.81%). Base A is highest among the 4 bases; G is the lowest. Features of lion mitogenome were compared with genomes of Felidae family. The genome size varies from 16773 bp to 17153 bp mainly because of variation in control region length. GC content of all the genomes is ranging from 39.37% to 41.19% (Table 1). Location of the mitochondrial genes were deduced, using online annotation server MITOS . Complete mitogenome contained 37 genes which include 13 protein coding genes, 2 rRNA genes, 22 tRNA genes and the control region (Figure 1). Gene order and origin of reading frame of all protein coding genes were identical to Carnivora. Major difference in P. leo persica mitogenome was observed in size of the control region (1,603 bp). 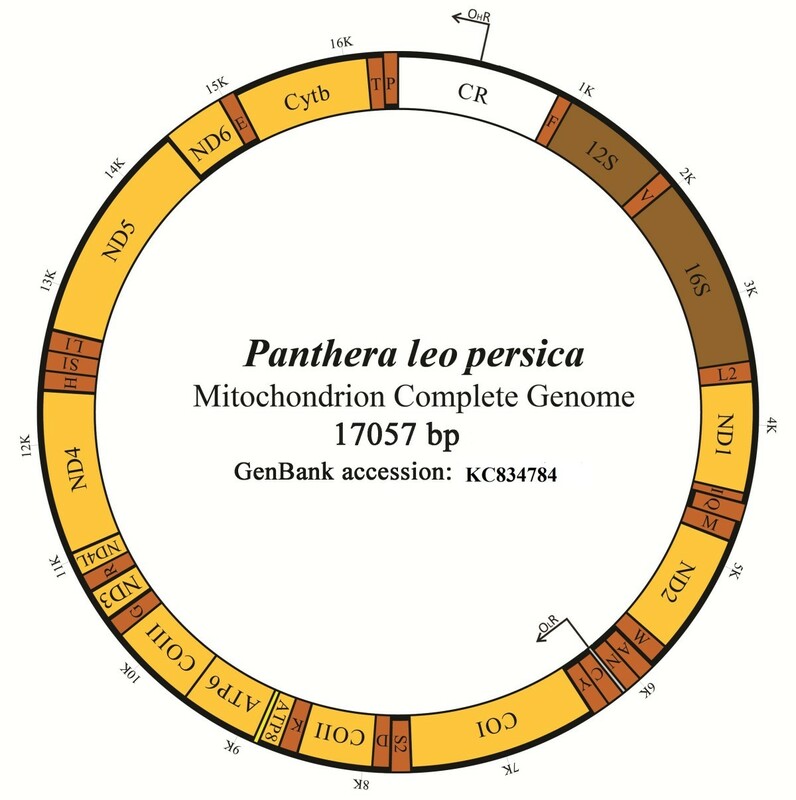 Complete mitochondrial genome organization of Panthera leo persica . Transfer RNA was annotated in a single letter amino acid code. OHR and OLR represent the replication origins of H strand and L strand. Except for ND6, all protein coding genes were H strand encoded. Position of genes and control regions (CR) were indicated with Arabic numerals (Table 2). The studied mitogenome comprise of 13 protein coding genes (11,364 bp) and share 66.62% of total genome. These genes encode 3788 amino acids (Table 2). The longest gene was ND5 (1815 bp) and the shortest gene was ATP8 (198 bp). The start and termination codons appeared universal among species. ATG was commonly used as start codon for all the genes except ND2, ND5, COX1, ND6 and ND3, which used ATA, ATT and ATC, respectively. TAA was commonly found as stop codon while Cyt b ended with AGA. Termination of Cyt b gene with AGA, is typical for mammalian species [15–17] which is distinct from others such as amphibians , reptiles [19, 20], Aves  and Nematoda . 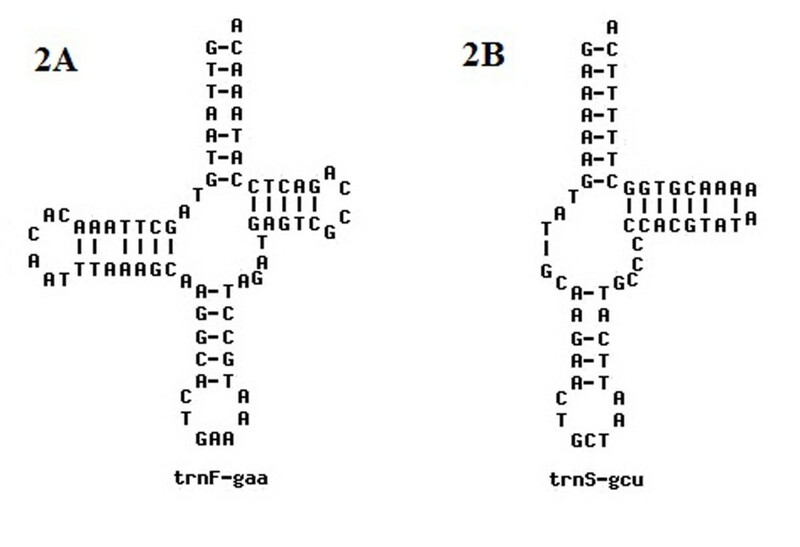 ND3, ND4, ND2 and COX3 have incomplete stop codons. These incomplete termination codons are common in metazoan mitogenome and can be converted into complete ones by poly A after transcription (TAA) . Total 22 tRNA genes were found in mitogenome of P. leo persica, amongst these tRNAser and tRNAleu had two termination codons (Table 2). Length of the tRNA genes in vertebrates is reported from 59 to 75 bp . In this study, the shortest tRNA is tRNAser (59 bp) and longest is tRNAleu (75 bp). Cloverleaf secondary structure of tRNAs of this genome was predicted, out of which representative structures of tRNAphe and tRNAser are shown (Figure 2). Out of all tRNAs, tRNAser lacked the “DHU” arm . The location of 12S rRNA (964 bp) was between tRNAphe and tRNAval and 16S rRNA (1576 bp) was between tRNAval and tRNAleu. Secondary structures of tRNAs. The secondary structure of (A) - tRNAphe. (B) - tRNAser. The control region of the mitogenome of P. leo persica is located between tRNAPro and tRNAPhe. It contains only promoters and regulatory sequences for replication and transcription, but no structural genes (Figure 3). CR is divided into three parts: the left domain (16,321-16,808bp) which includes the hyper variable segment HVS-1, the central conserved region (CCR) of 529 bp, and the right domain of (280–867 bp), which include HVS-2. Further the repetitive sequence RS-2 is in the left domain located at the 5’ end. It consists of long repetitive motif of about 80 bp which is repeated 4.7 times (3’-CCCCATGAATATTAAGCATGTACAGTAGTTTATATATATTACATAAGGCATACTATGTATATCGTGCATTAACTGCTTGT–5’). RS-3 is located in right domain at 3’ end. It consists of short repeat units of 14 bp which is repeated 20 times (3’-ACACGTACACACGT-5’). RS-3 is highly variable in the arrangement of specific motifs and is heteroplasmic. It is varied in terms of repeat numbers and motif among Felidae species (Table 3) . When there are repeats in the genome longer than the read length, it is important to confirm NGS data with capillary sequencing. Here, RS-2 and RS-3 repeats have longer region than read length of Ion Torrent PGM. Hence RS-2 and RS-3 were validated with capillary sequencing and capillary data (RS2 and RS3 repeats) was replaced in original genome obtained from NGS. Conserved sequence blocks (CSB-2 and CSB-3) are in HVS-2. CSB-1 is in the CCR, which is located between RS-2 and RS-3. CR of P. leo persica comprises 1,603 bp and it contains origin of heavy chain replication. The capillary data of RS2 and RS3 repeats was submitted to TRA (Trace archive Id: TR-16480). Structure of control region of Panthera leo persica mitogenome. Showing conserved blocks, location of repetitive sequences (RS), and other defined domains. RS2 motif sequence remains conserved, while RS3 motif varies in Felidae family. 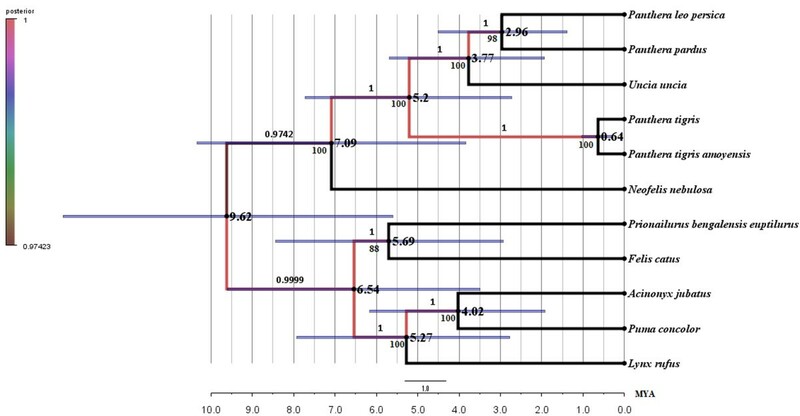 Phylogenetic analyses was carried out on the basis of partial  and full gene sequences of 12S rRNA, 16S rRNA, ND2, ND4, ND5, ATP8 and Cyt b using ML, MP methods (Figure 4). The monophyly of the genus Panthera, including P. leo persica, Uncia uncia, Panthera pardus, Panthera tigris amoyensis, Panthera tigris, and Neofelis nebulosa was clearly depicted. Results demonstrate 100% bootstrap value in ML method and 99% in MP method, using full gene sequences of P. leo persica (Figure 4A). Previously sequenced Panthera leo partial genes formed node with Uncia uncia with 96% bootstrap value in ML method and 88% in MP method (Figure 4B). 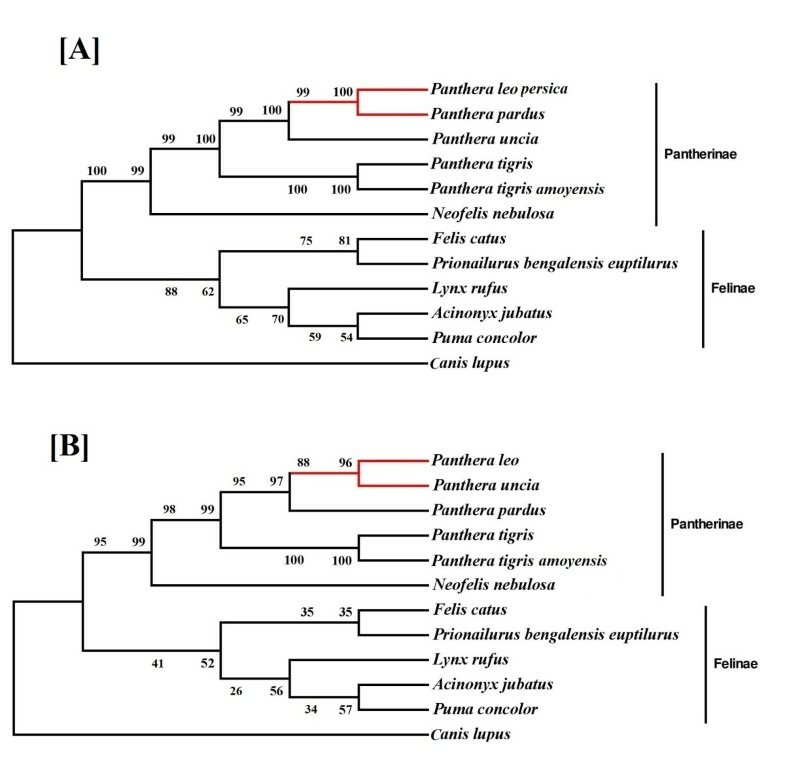 This study strongly supports that P. leo persica is a sister species of P. pardus, than of U. uncia, as earlier reported . N. nebulosa was forming distinct branch. P. tigris and P. tigris amoyensis being same species, formed different branch in the Panthera node while U. uncia was placed in the lineage between tiger and lion-leopard node. Maximum parsimony and Maximum likelihood based gene cluster phylogeny. (A) Full gene sequences and (B) partial gene sequences. Numbers represent bootstrap values. The ML and Bayesian analyses based on 11 complete mitochondrial genomes, excluding control region yielded the identical tree topology supported by high bootstrap value (above 90%, Figure 5) and high posterior probabilities (above 0.97, Figure 5). Uncorrelated lognormal relaxed clock (Figure 5) and strict molecular clock model (Additional file 1: Figure S1) were studied to estimate divergence times. Data of uncorrelated lognormal relaxed clock were considered for lineage specific rate heterogeneity. Divergence time was estimated using single calibration point at 10.78 mya for Felidae individuals, assuming common ancestor between genus Panthera and other Felinae species [28, 29]. BEAST analysis suggested divergence time of Felidae individual was 9.62 mya (Figure 5) from the common ancestor. The divergence of P. leo persica was estimated 2.96 mya from the closely related species P. pardus (ML, 98%; Bayesian, 1.00). Divergence of other individuals; N. nebulosa (7.09 mya), P. tigris (5.2 mya) and U. uncia (3.77 mya). Estimation of divergence times of genus Panthera in the present study reconfirms earlier reports [30, 31]. 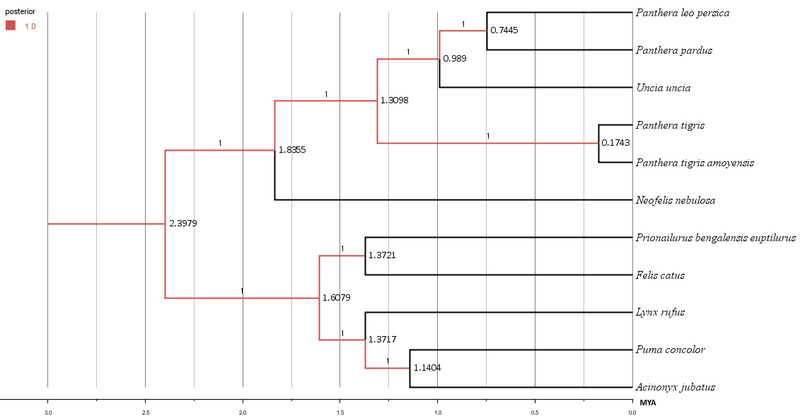 Phylogenetic tree and divergence time estimates. ML and Bayesian analysis based on whole mitogenomes. Numbers above the nodes represent posterior probabilities and numbers below the nodes are bootstrap values. Bold numbers represent estimated divergence times. The 95% highest posterior density estimates for each clade are presented by bars. Present study is the first report of complete mitogenome of P. leo persica among all eight subspecies. The evolutionary timeline estimates of big cats based on mitogenome analysis, indicates existence of common ancestor of P. leo and P. pardus 2.96 mya in modern Piacenzian era. The significant degree of genetic differentiation of Asiatic lion from other big cats, suggest independent evolution of subspecies described as P. leo persica. Complete mitogenome sequence provide sufficient information to resolve the events of divergence of Felidae. Tissue sample of a freshly dead lion cub (female, 1.5 yrs) with chip ID 00-06B7-22E3 was collected from Sakkarbag Zoo, Junagadh, Gujarat, India (N 21.540848, E 70.468481). The samples were immediately transferred to laboratory and stored in Allprotect Tissue Reagent (Qiagen) at −80°C. Tissue sample was homogenized in liquid nitrogen and DNA extraction was carried out using BioVison Mitochondrial DNA Isolation Kit (BioVision Research Products, CA, USA) following manufacturer’s protocol. DNA quality such as ratio of absorbance at 260/280 nm and 260/230 nm was measured using Nanophotometer (Imlpen). Qubit® 2.0 Fluorometer was used to obtain an accurate quantitation of DNA. Library was prepared using Ion Express Plus Fragment library kit (Life Technologies). Mitochondrial DNA was sheared into blunt ended fragments by enzymatic lysis using Ion Shear Plus Reagents (Life Technologies). The fragmented DNA was ligated to Ion-compatible adapters, followed by nick repair to complete the linkage between adapters and DNA inserts. Sequencing was performed using Ion Express Template 300 chemistry (Life Technologies) on 316 chip following manufacturer’s protocol. Capillary Sequencing of D-loop region was performed to validate Ion Torrent data. PCR of D-loop was performed using forward (5’TCAAGGAAGAAGCAATAGCC 3’) and reverse (5’GGATTGTTGGGCGTGTAAA 3’) primers. Further sequencing was carried out using PCR primers and internal primer (5’TATTCTCTATGCGGGGGTTC 3’) using Big Dye v3.1 Chemistry (Applied Biosystems) on 3500 Genetic Analyzer (Applied Biosystems) following manufacturer’s protocol. Reads longer than 100 bp were mapped to the P. pardus reference mitogenome [GenBank: NC_010641], using CLC Genomic Workbench 5 . Assembled mitogenome was annotated, using MITOS online mitochondrial genome annotation server . Control region repeats RS-2 and RS-3 were identified using Tandem Repeats Finder . Phylogeny of P. leo was constructed based on partial and full mitochondrial gene cluster (12S rRNA+16S rRNA+ND2+ND4+ND5+ATP8+Cyt b). Partial P. leo genes having accession number A79300, AF006457, AY170043, AY634398, AF006458, S79302 and DQ899945  were retrieved from NCBI. Full sequences of above same genes of P. leo persica were compared with gene sequences of P. uncia [NC_010638], P. pardus [NC_010641], P. tigris [NC_010642], P. tigris amoyensis [NC_014770], N. nebulosa [NC_008450], A. jubatus [NC_005212], P. concolor [NC_016470], L. rufus [NC_014456], F. catus [NC_001700] and P. bengalensis euptilurus [NC_016189] obtained from NCBI organelle genome resource (Table 1). The data was subjected to Maximum likelihood (ML) and Maximum parsimony (MP) methods using MEGA v5.05 software package  to establish phylogenetic relationship. These seven genes were concatenated and multiple alignment was carried out using ClustalW built-in MEGA. The number of bootstrap replicates was set to 1000 and phylogeny was constructed using Hasegawa-Kishino-Yano model, determined by MEGA 5.05 as the best fitting nucleotide substitution model. Multiple sequence alignment of genomes was carried out and phylogenetic tree was constructed using HKY+G+T substitution model at 1000 bootstrap replicates. Divergence times were estimated between species using Bayesian evolutionary analysis by sampling trees (BEAST v1.7.1) software . Markov Chain Monte Carlo (MCMC) procedure was used within a Bayesian analysis framework to estimate posterior distributions of evolutionary rates and divergence times. These analyses were performed using DNA sequence alignment of complete mitogenomes, excluding control region. Divergence times were estimated using an uncorrelated lognormal relaxed clock to account for lineage-specific rate heterogeneity as well as using strict molecular clock model (Additional file 1: Figure S1). Bayesian MCMC analyses in BEAST were performed using HKY model of evolution and gamma+ invariant rate heterogeneity models. Divergences were estimated under a Yule speciation process that is generally more appropriate when considering sequences from different species . Monophyletic constraints were imposed for the node to calibrate evolutionary rates. Normal priors were used for the times to the most recent common ancestor (TMRCA) of Pantherinae and Felinae is (mean 10.78 ±1.87 mya), based on the posterior distributions obtained . Simultaneous Markov chains were run for 10,000,000 generations, sampling every 1000 steps. Thus the “.trees” file will contain 10,000 trees and after removing 10% burnin, tree was annotated using TreeAnnotator. Posterior probability limit was set to zero to annotate all nodes. Maximum clade credibility tree was selected for target tree to find highest product of the posterior probability for all nodes. The phylogenetic tree graphic was generated using FigTree v1.3.1 . The complete mitogenome sequence with gene prediction and functional annotation was submitted to GenBank with accession no. KC834784. The raw sequence data generated from Ion Torrent was submitted to SRA with accession no SRR821548. Mitochondrial D-loop sequence was submitted to GenBank with accession no. KC917264. This research was majorly supported by Gujarat State Biotechnology Mission, Department of Science & Technology, Government of Gujarat, INDIA under The LeoGen pilot project. Authors are thankful to Shri Ravi Saxena, IAS, Additional Chief Secretary, Department of Science & Technology, Government of Gujarat for providing full support and administrative freedom for Gujarat State Biotechnology Mission for undertaking this project. Authors are also thankful to Gujarat State Forest Department for providing bio-materials and part financial support. Authors are specially thankful to Dr. S. K. Nanda, IAS, Principal Secretary, Forest & Environment, Government of Gujarat, Shri Pradeep Khanna, IFS, Principal Chief Conservator of Forest & Head of Forest Force, Gujarat, Shri S. K. Goyal, IFS, Principal Chief Conservator of Forest, Wildlife & Chief Wildlife Warden, Gujarat who facilitated in getting the necessary permission from Ministry of Forest & Environment, Government of India, Government of Gujarat. Authors are also thankful to Shri M. M. Sharma, IFS, Ex-chief Conservator of Forest, Junagadh Wildlife Circle, Shri R. L. Meena, IFS, Chief Conservator of Forest, Wildlife, Junagadh, Dr. Sandeep Kumar, IFS, Deputy Conservator of Forest, Sasan and Shri V. J. Rana, Director, Shakkarbaug Zoo for providing all help and co-operation in enabling the availability of bio-material from different areas. Authors are thankful to the field staff and veterinarians, involved in collection of samples. AKS, SBB and MNJ conceptualized this study, ASP, OVP, RPP and FPJ carried out the mtDNA extraction, SBB, MNJ, RVP, ASP, AS and RPP performed the sequencing, SBB and SMD carried out the mitogenome assembly, annotations and phylogenetic studies. SBB and team drafted the manuscript. All authors read and approved the final manuscript.